Many scholars have recognized that physical activity among children and adolescents is dramatically decreasing. According to many studies the current level of children’s' physical activity does not meet health recommendations. Decreased physical activity can also be seen as a contributor to impaired motor skills. Sufficient development of motor skills - especially fundamental movement skills - is important because it helps children to survive the physical challenges which they meet in their daily life. Additionally, it has been demonstrated that the versatile fundamental movement skills acquired in childhood are related to a physically active lifestyle during adolescence and adulthood. A child who has learned a wide variety of fundamental movement skills is more likely to participate in a range of organized physical activities as well as engage in more general daily physical activity. Regular physical activity not only develops health but according to many studies is also related with better academic performance and cognitive functioning. Regular physical activity is associated with cerebral capillary growth, which in turn increases blood flow and brain oxygenation. Physical activity has also been shown to increase the level of chemicals which support learning in brain. Additionally, physical activity has been found to grow nerve cells, develop new nerve cell connections, and increase brain tissue volume. These changes in the brain are associated with many mechanisms which contribute to learning. These include, for example, attention, concentration, and memory strategies. Studies have revealed that children who are fit learn better than children who are not fit. Physical fitness for example, has been shown to be related academic performance in mathematics, reading, and different languages. Additionally, an interesting research finding is that children who have better fitness behave better and participate more positively in lessons at school. This book got its origin from the need to contribute children’s' physical activity and to develop their motor skills. The book consists of two parts: theory and practice. The purpose of the first part is to provide theoretical basis for later activities. The first part of the book concerns motor learning, fundamental movement skills, physical activity recommendations, versatile goals of children’s' physical activity, and physical activity motivation. The first part of the book helps reader to understand the basic theory behind activities and to build up appropriate exercise sessions. The second part of the book includes 235 activities to develop childrens' fundamental skills. The second part has been divided into four sections which are traditional Finnish outdoor activities, locomotor skill activities and games, balance skills activities, and manipulative skills activities. A section to include locomotor skills exercises is divided into tag (running) activities and other locomotor activities. Although this book is organized into different fundamental skills themes it is important to recognize that almost all exercise develop many skills at the same time. For example, it is evident that balance skills develop by engaging in any play or game described in this book. All activities presented in this book include a) goals of the exercise, b) target group (i.e., early education, elementary school, secondary school, adults), c) demand time of a play activity or game, d) complexity of the activity, e) required preparation for the exercise, f) suitability to be implemented inside or/and outside, g) equipment required, h) examples how to apply and differentiate the activity. Activities demonstrated in this book do not demand specific education. All practices can be implemented by, for example, teachers, coaches, directors, and people who are working with different groups. The successful implementation of several of the activities detailed in this book need specific equipment. However, this equipment is very simple and can typically be built by the person who is managing an activity. Many of the activities presented in this book are suitable for the majority of the population ranging from early childhood to adulthood. This book is suitable for teachers and students in early education, all levels of teacher education, and directors and coaches in different organized physical activities such as sport clubs. Although activities described in this book are suitable for many target groups the main emphasis is in early education because these children go through a "golden period" of learning fundamental movement skills. This phase in motor development is important because within that time period children can learn many fundamental movement skills if they have a possibility to practice them in their living environment. This book also includes several examples how to develop entire training programs in early education. 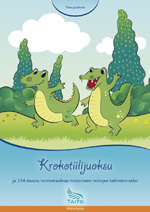 The author of this book, Dr Timo Jaakkola works as a lecturer of sport pedagogy at the University of Jyväskylä in Finland. He has 50 peer reviewed scientific articles that relate to the learning and teaching of motor skills, physical activity, and sport and exercise motivation in childhood and adolescence. Additionally, he has been an author or co-author of 10 books covering these topics.